Below please find copies of slides from the talks at the Timing Workshop in Barcelona on Oct. 8, 2017. Below please find copies of slides from the talks at the Timing Workshop in Melbourne on Oct. 18, 2015. The cPCI-EVRTG-300 combines a low jitter Event Receiver and an Electron Gun Trigger Transmitter. 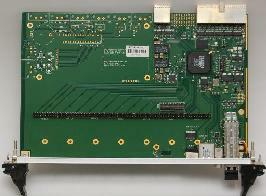 The EVRTG has altogether eight outputs: four on two Universal I/O Modules, two differential LVPECL outputs and two SFP outputs. All output signals are produced with Virtex 5 GTX serializers, so that pulses, frequencies and bit streams with a resolution 1/40th of the event clock cycle period can be achieved, that is, 200 ps with an event clock of 125 MHz. In addition to this each output has a programmable delay line with 1024 adjustable steps of ~10 ps. 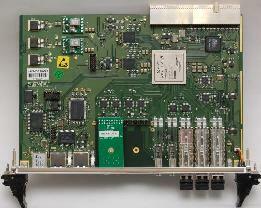 Two new 6U CompactPCI products are released: the cPCI-EVG-300 and the cPCI-EVR-300.